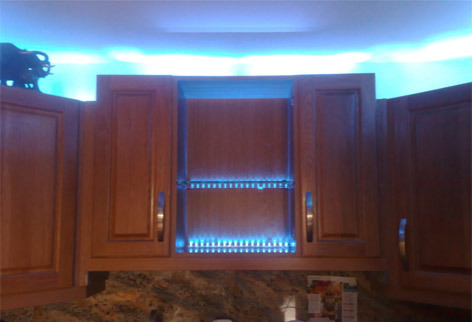 This client wanted a moody and calm atmosphere whilst in the kitchen so we suggested the installation of LED blue tape light to three kitchen cupboards. The client was very pleased with the result. The tape light is sections of lighting modules fixed together into standard lengths. You are able to cut it down to exact lengths with some manufacturers but you may find it affects the brightness. They come in standard 230V or 12V (12v for bathrooms or outdoor). They give an outstanding affect and lamp life is 25000 hours. It was a pleasure to install.